Buyer personas are a well-worn technique adopted by marketers to get under the skin of customers. But personas also have a crucial role to play in the increasingly important discipline of customer journey mapping. Buyer personas are a well-worn technique adopted by marketers to get under the skin of customers. A fictional but data-driven profile of your ideal or actual customers, buyer personas have long been used by the marketing department as a way to surface and document customer needs and wants, and help understand how customers make purchasing decisions. And if accurate, these completed personas can then enable marketers to better segment their messaging, by targeting different personas with the most appropriate content and offers; develop new products/services based on the needs and wants of your key customers; and reach the right people, thereby pre-qualifying leads by attracting the right leads. But personas also have a crucial role to play in the increasingly important discipline of customer journey mapping. 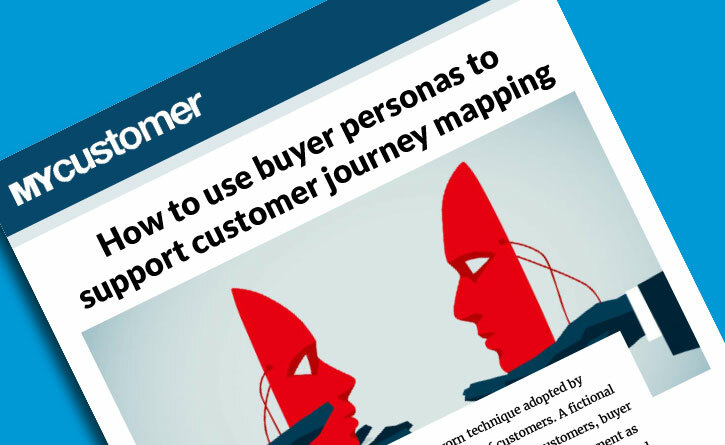 So with buyer personas playing such an important role in the overall customer journey mapping process, it is vital that organisations create valuable personas that provide a robust platform upon which to build the maps. The question, then, is how to successfully generate these customer personas. And to answer that question we must first establish what constitutes a robust buyer persona. A persona name, image or photo – depicting the customer segment that you are aiming to portray. “A name and photo helps to bring the customer segment ‘to life’ and means that stakeholders can more easily relate to the specific customer type,” says Smith. Needs and goals. What is your persona trying to do, why and by when? Motivations. What are their key triggers and barriers? What influences their thinking? And do they have an actual need or feeling pressure from elsewhere? Behaviours. Where do they find information? Is your persona spontaneous or do they research and plan every detail? What media channels do they like to use? Profile. Think about your persona’s demographics. It can also be useful to think about variables like price sensitivity, confidence with technology and amount of leisure time and whether your persona over- or under-indexes on them. Quotes and photos. Bring your personas to life. It’s important that they are stereotypes that feel real so give them a name, add comments captured through research and photos of what they look like. Other information that should be accounted for in the template is transactional data, such as purchase histories and post-sale service records. With the template in place, it’s now time to fill it out! While some buyer personas are built to be aspirational, if the personas in question are being used to support customer journey mapping, the profiles need to be built around real customers groups. Therefore, in order to fill out the template, you need to ensure you know all the information in question – and that means doing some deep customer research. “You need to get away from your desk and computer, get out of your building and go! Talk to people, listen to them, meet your customers and stakeholders,” says Arne van Oosterom, ‎senior partner and founder of DesignThinkers Group. But Spyer recommends that persona work should also incorporate data above and beyond customer interviews, including existing information and the knowledge that exists within your own four walls. “You can't just make your personas up. They should be informed by your data and research. This may mean kicking off new research that’s specific to your objectives. But we often find that a lot can be gained from working with existing research,” he notes. Finally, with the research conducted and the persona templates completed and verified by stakeholders within the organisation and the customers themselves, there is one final consideration – design. It is important to remember, however, that persona work doesn’t end there. While it provides the catalyst to build customer journey maps that are appropriate to this particular moment in time, the reality is that with business objectives, markets, products, services and customers all continuing to change over time, personas can become outdated. Hinshaw notes: “We encourage customer experience teams to conduct regular reviews of persona to ensure they’re accurate, as well as proactively engaging across the business to stay on top of initiatives that need customer insight.